Could office noise levels damage your hearing? Our office of 50 people hums along at a "normal (for us)" noise level. People talking on the phones, intercom pages, the copier in the corner... all of that adds up. And usually I don't notice it. But after hours, on the drive home, I start to notice just how loud the office was during the day. And apparently, I'm not alone. A survey published earlier this year by EPIC Hearing Healthcare looked into noise in the workplace as a matter of healthcare and business costs. The main question posed was this: How many hours a day do you believe your workplace is noisy (loud enough you would have to raise your voice to be heard)? Fifty-five percent of employees said it was that noisy for more than an hour a day, and 36 percent said it was too noisy for more than three hours each working day. Their finding? That employers may be underestimating the noise levels faced by employees, which could have serious consequences, given that noise exposure is the most common and preventable contributor to hearing loss. 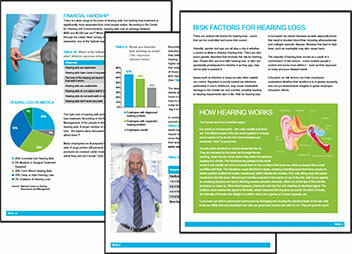 The study not only includes survey results, but several suggestions on what employers can do to help prevent employee hearing loss, which can lead directly to reduced sick time and accidents. First on the list? To perform what they called a "fresh assessment" of the workplace noise, so both employers and employees are on the same page, and can build a hearing wellness program that benefit all involved. Want to learn more? Read the whole study here. Ready to take the next step? Talk to the team at RAECO Rents about sound level and noise monitoring instruments available to perform your next workplace noise study.